The yearning to conquer a 4000er even without a peak athletic performance is here fulfilled at least symbolically for each viewer upon treading instead of the imposing peak into the space refunctioned by Simon Beer into a "viewing point."... The circular machinery of the museum's air conditioning is interpreted as the railing of an elevated walk-on platform. The breadth of the sky blurs into the dome's light. Even the mundane floor plug outlet in the middle is integrated into this work. It marks the ideal observer's standpoint at which he becomes the midpoint of an illusionistic world. 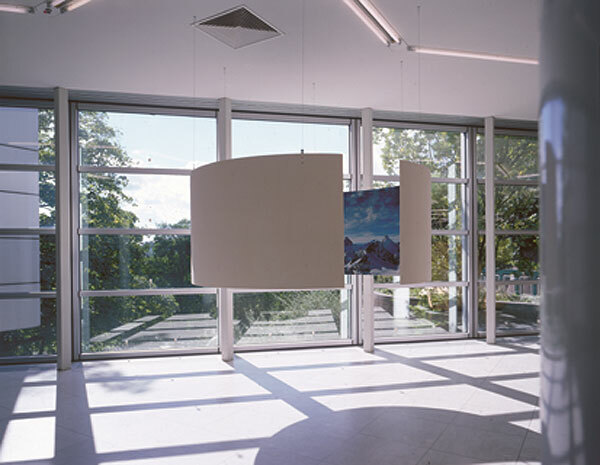 Further, Simon Beer exhibits three sculptural objects: transportable, walk-in "cells," each of which conceals inside it a different 6.5 m long panorama photograph of the peak of another 4000er in the Swiss Alps. 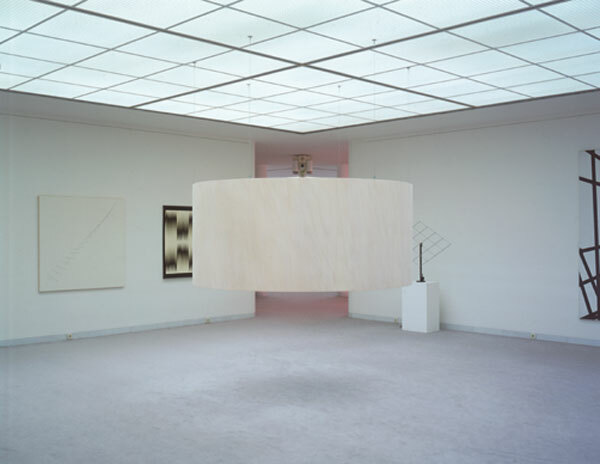 These appear as light constructions, bent into rings, hanging from the ceiling, open above and below and merely provided with a narrow entry slit on one side. ...Each cell delineates its own room in the middle of the museum, temporarily transposing the viewer to another locale in higher spheres without risking the danger of losing contact with the earth, as is clearly signaled by the “grounded” pair of legs visible from outside. Paradoxically, in the sheltered claustrophobia of the cell, the impression of unlimited space and freedom arises, transmitted by the fascinating landscape images, by now presented as high-gloss photographs. 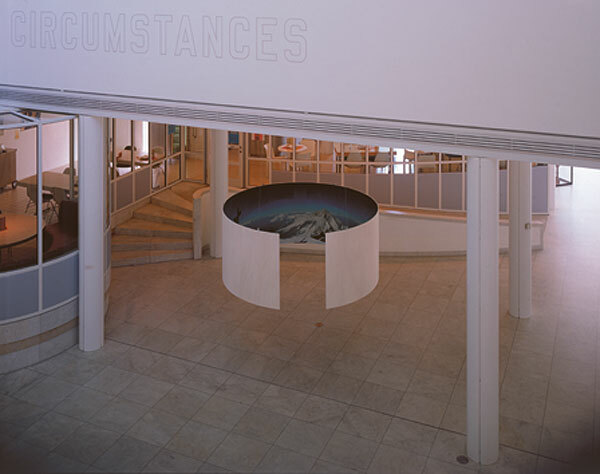 These objects' (exhibition) sites can be varied within the museum. The hike from peak to peak leads through the history of art. If the breathtaking Alpine panorama was originally a unique unforgettable experience bearing the cachet of exclusivity, the highlight and reward for a long and difficult cliimb, thanks to reproductional media it is now effortlessly available whenever and wherever wanted. Inflationary, its becomes the distortion of itself. At the latest when yet another panorama in yet another space in yet another techniquue reveals itself for the umpteenth time, it becomes clear to the museum visitor that this installation is about power and media mechanisms, about their influence and compensatory function... Simon Beer's installed panoramas promise a view of paradise only to simultaneously provide insight into the expulsion from it. Media seduction is not merely indelible but unwithstandable. fourthousandtwohundred- twentyone, in underground level with kinetic art. fourthousandsixtythree, on ground floor with view of parking area and sculpture garden. fourthousandfivehundredsix, on ground floor (foyer to dome room); cafeteria in background; above, wall painting by Laurence Weiner. 12-ply panels, Ø 325 cm with opening of approx. 40-50 cm, mounted to ceiling on wire cables. 3 panorama photographs of relevant mountain peaks, ca 100 x 65 cm (Cibachrome). 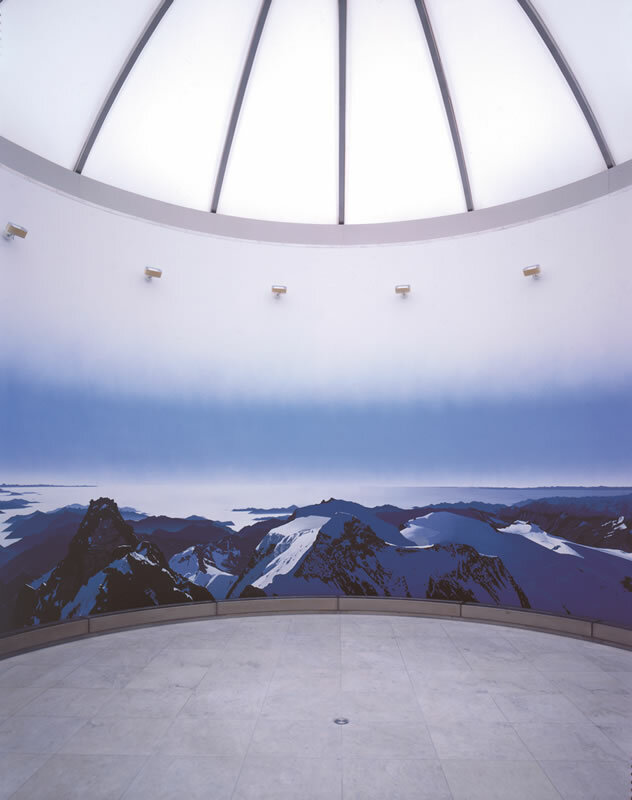 In dome room: wall painting, acrylic, ca. 2400 x 350 cm.